Caldera, or caldaria to give them their Latin name, are cooking pot shaped depressions in the earth formed after the cooling magma chamber of a volcano forms a void and the rock above collapses. These collapses can be sudden or take thousands of years. When a caldera is formed by the implosion, dropping of rock, there can be significant atmospheric disruption that can have global consequences. The caldera formed after Krakatoa caused the world’s temperature to drop significantly. 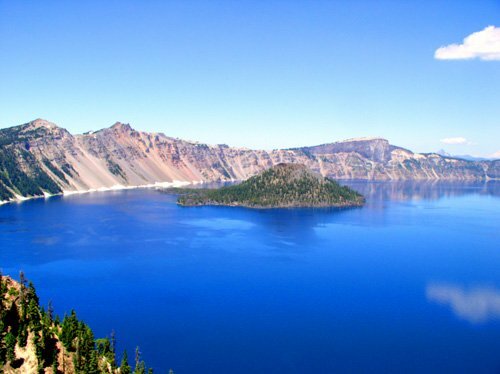 Perhaps one of the most iconic and most photographed caldera of all time is Crater lake in the US state of Oregon. Its geology and inspiring natural beauty led the area to become a national park in 1902. The caldera is a remnant of mount Mazama, an ancient strato-volcano and formed some 7 to 8 thousand years ago. The lake is the deepest in the United States at a depth of 594m. Set within the caldera lake is Wizard Island, this volcanic cinder cone rises up out of the caldera’s lake water to its peak, where its crater effectively creates a caldera, in a volcano, in a lake, in a caldera, in a volcano; an example of a stacked caldera. Caldera – The What and How? Caldera are formed from two district types of volcano, The strato-volcano and the shield-volcano. A strato-volcano, or composite volcano, is a conical volcano built up by many layers. An example is mount Fuji in Japan. Strato-volcanoes have steep sides as they are built from lava that cools quickly and does not travel very far, hence each eruption builds layer upon layer. Shield volcanoes are characterised by a flatter and much more spread out footprint, which is due to their formation from fast flowing lava that tends to form large fields. Sometimes these geological features are visible above ground, and sometimes they are concealed by water. The Greek island of Santorini’s caldera is at first glance not visible, it is only when you realise the islands of Santorini form an almost perfect circle that the caldera becomes obvious. The Santorini caldera has been submerged in the Aegean sea, leaving only the sides of the strato-volcano that it formed from jutting out of the sea to form the Greek island that bares it name. 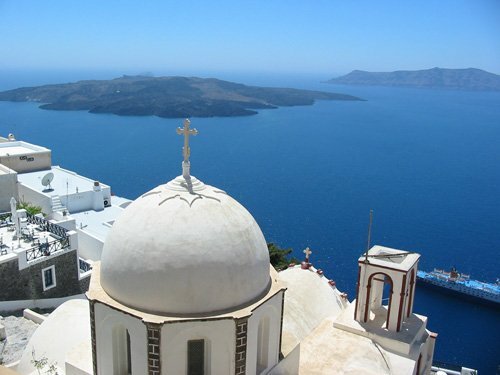 It is thought that the giant explosion that created the Santorini caldera was responsible for the end of the Minoan civilisation with the resulting tsunami and the collapse of land leading to the birth of the legend of Atlantis. There are three well documented types of Caldera. The crater type, basaltic calderas, and the resurgent calderas. In essence what these types represent is where and how many collapses have caused a caldera to form. A resurgent caldera is the result of more than one collapse. Basaltic calderas are the result of shield volcanoes collapsing. These types of collapse tend to happen slowly, while crater or lake types tent to be the result of strato-volcanoes’ magma chamber voids collapsing, often at explosive rates. 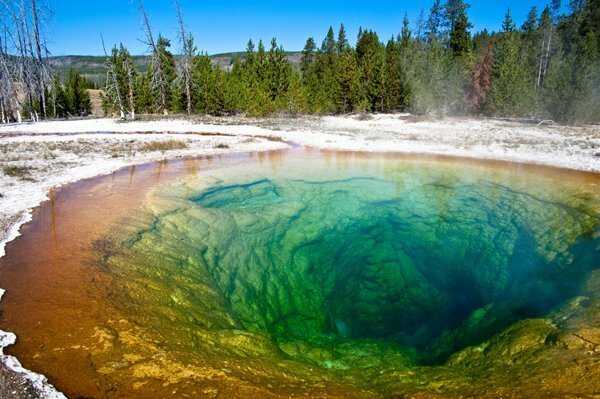 Yellowstone National Park in the western United States is essentially one massive caldera. The Yellowstone caldera is the result of resurgent activity over thousands of years. What makes Yellowstone unique is that the magma chamber that has formed under the surface here is relatively stable, while the earth above it is moving glacially across the magma chamber’s surface. 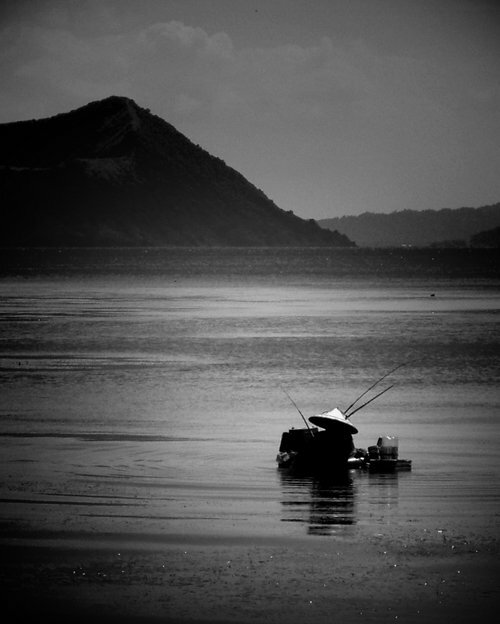 The Taal lake caldera in the Philippines has a chequered past, with much death and much life. A strato-volcano some 60km south of Manila, it features a lake caldera lake some 22km in length. There have been thirty or so eruptions and caldera collapses since the mid 1500s that have been responsible for thousands of lives being lost. Some of the people killed were thought to have perished from tsunamis forming in the lake from the force of the eruptions. It is one of the few places on earth that has experienced inland tsunamis or ‘lake tsunami.’ Today the lake supports many fishing villages, with fishing and tourism the main source of income. In summer 2011 a mass die off of fish was caused by a sudden change in the lake’s water temperature. It is unclear if this was down to a geological volcanic event. 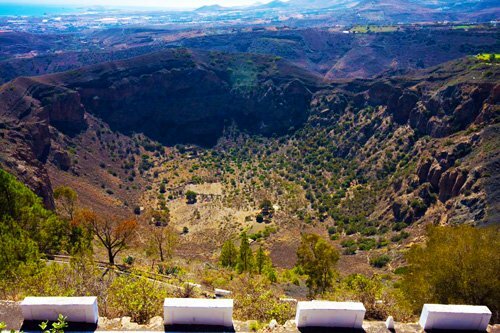 The Caldera de Bandama on the island of Gran Canaria in the Canary Islands, located off the west African coast, is one of the worlds most accessible calderas. The tip of the volcano that the magma chamber which collapsed forming the caldera forms an excellent vantage point to over look the deep depression. There is also a well-trodden path winding its way down to the centre of the caldera that takes about 90 minutes to walk. It’s easy to imagine yourself descending into a prehistoric world. The Laacher See is a caldera in the Rhine Valley of Germany some 30km south of Bonn. 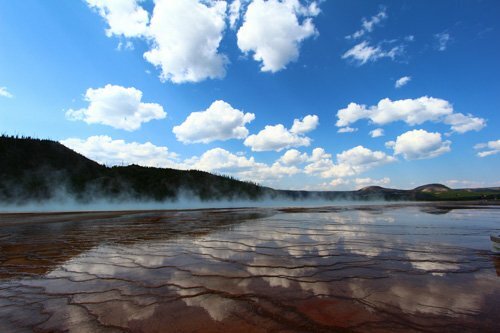 It has a caldera some 8km wide and its lake has been studied since ancient times. The caldera is part of the Eifel field of volcanoes arising from a mantel plume under the European continent. The ash from the eruption some 13,000 years ago that formed the caldera can be found throughout central Europe and the North sea. The caldera and volcano beneath it could still be active, as CO2 seeps out of the rock and bubbles up in the lake; this is likely to be caused by magma degassing under the lake. In ancient times, according to folklore, medieval monks sleeping nearby were overcome by a CO2 cloud steaming from the lake, and died. Interesting Everything has not found a photo that we can use as yet for this caldera. If you know of one please comment below. 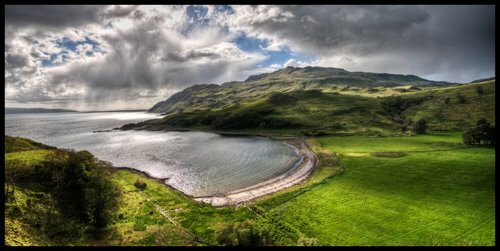 Ardnamurchan caldera in Scotland is the UK’s biggest Caldera. The western end of the Ardnamurchan peninsula in Scotland contains a complex of volcanic structures that collectively form a giant Caldera. The caldera is best viewed from the air, as the relatively shallow depth of its bowl compared with its great size make it difficult to see from the ground. The photo we have used is actually of the beach that sites at the foot of this caldera. You can see the walls of the colapsed volcanic activity in the background of this photo. If you have some time, take a look at Google maps and select the terrain view. You can easily see the ring of concentric peaks surrounding the caldera bowl. The area today is populated by smallholdings and grazing animals. The end of the Ardnamurchan peninsula is the most westerly point in the UK, and further west than some parts of Ireland! 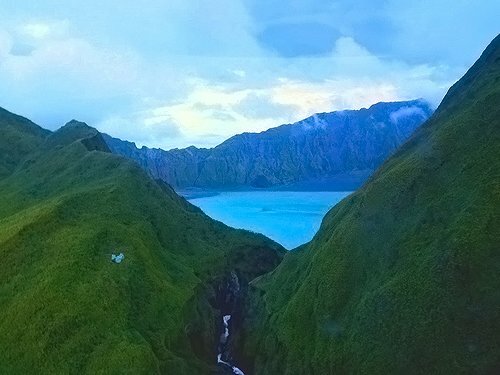 Pinatubo caldera is an example of nature in action. It is one of the worlds newest and most reported caldera lakes. Formed after water filled the caldera created by the relatively recent eruption in 1991. Due to concern over flash-floods which could be caused by the crater walls collapsing, work was carried out to drain some of the water from the lake, a world first! After the works were completed it was found that the rock was of a harder type than thought, and the caldera was allowed to re-fill. i love caldera formation. go!!! could you put a picture of the formation of a caldera please. thanks. Are there any Caldera in Ireland?